Working Families: Can making diapers tax-exempt in Indiana help families save? INDIANAPOLIS — As somebody who always has young foster kids, Martha Pfleeger goes through a lot of diapers. “We just finished up having three foster kiddos with us, and they were all three in diapers,” she said. But now, Pfleeger and her husband have two foster children in diapers. She currently goes through about 600 diapers per month. Pfleeger understands the pinch that a lot of parents face. One in 3 families can't afford clean diapers for their children. To try and help low-income families in Indiana, a state lawmaker is trying to make it easier to buy diapers by making them sales tax exempt. 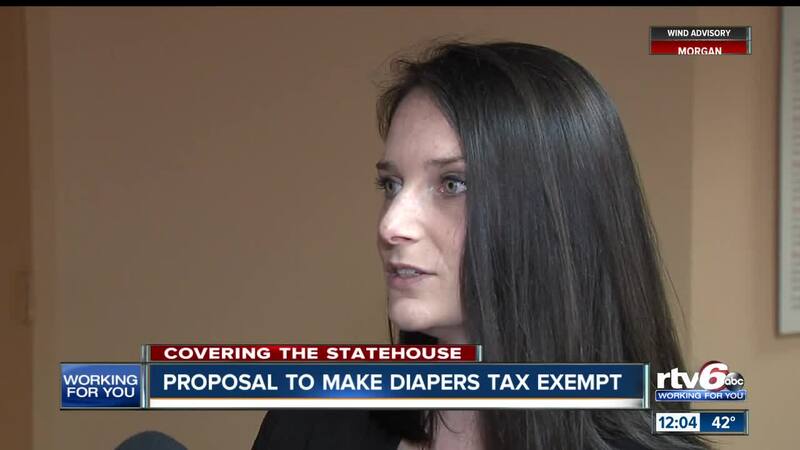 Rep. Carey Hamilton, D-Indianapolis, introduced HB 1289, which defines diapers and makes them exempt from sales tax. She introduced the bill after having discussions with an advocacy group that distributes diapers across the state. "They are hearing again and again that the cost of diapers are a real problem for these low-income families that they're serving," Hamilton said. "This is a small step to help those families afford diapers. It's a really important child health issue." Rachael Suskovich is the founder and executive director of the Indiana Diaper Bank , which distributes diapers to food pantries, women abuse shelters, foster programs and other places where children need diapers. The organization diapers about 300 children per month. "There are many more children who need diapers," Suskovich said. Neither SNAP nor WIC can be used for diapers in Indiana. 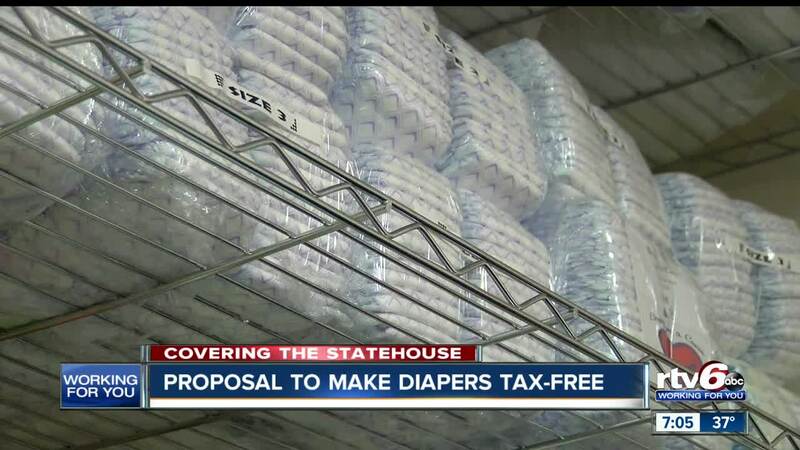 In Indiana, diapers are taxed at a standard 7 percent rate. The average family spends about $100 per child per month on diapers, Suskovich said. That means if diapers were tax-exempt, families would save an average of $7 per month. “That sounds like pennies on the dollar, but $7 a month savings would allow them to buy one more pack of diapers,” Suskovich said. If the bill becomes law, it would go into effect July 1. Pfleeger said she could support a bill that would allow diapers to be tax-exempt, but she’d like to know where the current tax money from diapers goes. “It’s easy for me, as a person who has three kids regularly, and will kind of indefinitely, as a foster family," Pfleeger said. "It's not like our kids are ever going to grow up and out of diapers. We choose to take kids who are 0-3 [years old]. We will always have diapers in our household. ... I recognize that not everybody has kids. Is the tax really helping the greater community in some way? I don't want to be short-sighted and say 'At all costs, this would be awesome.' If it's not going to be significantly impacting those who do not have kids, I would say for sure. Every little bit that we can help keep our kids in better health and saving those dollars. We would be using those dollars elsewhere." She also has considered supporting making cloth diapers tax-exempt, or able to purchase on the assistance programs – to help the environment. But many child care centers do not allow children with cloth diapers, and some laundromats don’t allow them, either. “That’s not overly beneficial if you’re looking at a population that’s utilizing some services here in the community,” Pfleeger said. Hamilton’s predecessor in her district, Christina Hale, proposed an amendment to a bill that would make feminine hygiene products and diapers sales tax exempt in 2016. The amendment failed 62-33. Many northeastern states do not have sales tax on diapers, including New York, Pennsylvania, New Jersey, Connecticut and Vermont. Other states, like Ohio, have sales tax holidays where they are exempt for a week or a weekend. While Pfleeger isn’t completely sure of her opinion on the bill, it could’ve helped one of the children currently in her care. Her 1-year-old foster child has scarring from diaper rashes from her previous caretaker.